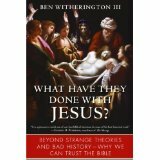 Tags: Ben Witherington, Ben Witherington III, Christianity, historical Jesus, inner circle, Jesus, Joanna, John, Lazarus, Mary, Mary Magdalene, Paul, Peter, Resurrection, What Have They Done With Jesus? This entry was posted on February 24, 2015 at 10:12 -04:00Feb and is filed under Apologetics, Book Plunge, Historical Jesus, Resurrection. You can follow any responses to this entry through the RSS 2.0 feed. You can leave a response, or trackback from your own site. In our culture, too often the culture will ignore the hard facts found in scholarship on the historical Jesus and instead go with the bizarre crank theories that you can find on the internet and the History Channel. The truth confronts us with our sin and our responsibility. Who wants that? So let’s distract ourselves with the bizarre. Then we won’t have to look at ourselves in the mirror, or at least, we can soon forget what we saw. The name game doesn’t impress. What people want are documents that constitute first-hand testimonies, and all we get in the Gospels is Paul saying “he appeared to me” sans details. Meanwhile every other claim of an appearance and every Gospel story constitutes second hand testimonies at best. It is questionable that Peter wrote the epistles attributed to him, so the brief mention of Jesus appearing to Peter in that epistle (also sans details) is likewise unimpressive. And why does Paul who never met the earthly Jesus have so many letters preserved that fill so much of the NT while only three brief letters attributed to the church pillars, Peter and James, are preserved?